Marvel and Image Comics fans should certainly be familiar with the name of Wes Craig. The Montreal native, who has drawn on Guardians of the Galaxy and other titles, is currently the co-creator of the new Image series Deadly Class. Wes took a moment to talk with our own Max Silver about his career and his new title. MS: How did you start your career in the comics industry? WC: I started working professionally about 12 years ago. I worked for DC Comics, then a bit for Wildstorm on Texas Chainsaw Massacre and Windstorm Revelations. After that I did some work for Marvel on Guardians of the Galaxy, and a few other things sprinkled in there. MS: Can you talk a bit about the inception of Deadly Class? WC: From what I remember, Rick had two separate ideas: one was a more autobiographical kind of comic, and another was about a school for assassins, and he merged those ideas together into Deadly Class. I think that's what makes the series interesting really, it's a school for assassins with all the action and mayhem that comes with that, but mostly me and Rick just get wrapped up in telling these high school dramas, and then we have to remind ourselves that we need to have some battles and explosions once in a while. MS: As a fan of Deadly Class, I've always felt that a large part of the title's identity are it's clique's. Goths, Punks, Gangsters and Preppies are just a small number of the subcultures you've illustrated. When you were creating the series, what was your process in tackling the identity and attitude of these groups and capturing the essence of that identity as it was in the late 1980's? So tapping in to those feelings, as silly as they seem now, is important to bringing these kids to life. MS: Your Deadly Class co-creator Rick Remender has often talked about certain events in the book being somewhat semi-autobiographical. Were there any personal experiences that shaped your work on the book? WC: Mostly Rick will tell me about these crazy stories and people from when he was a teenager and I'll often have something comparable, our teen years have a lot of similarities, so it's pretty easy to find my version of what he went through and bring some of that to the art. MS: Your paneling is a unique part of Deadly Class's visual identity and something very different to other monthly titles. Issue one had multiple pages with eleven even thirteen panels in a page. I found it reminiscent of the multi panel work seen in 80's comics like The Dark Knight Returns. Was this style of paneling done to feel more like a comic of that era? WC: Some of it is from those seminal 80's comics, definitely Dark Knight Returns, that's a big influence on the work, so is Miller's Ronin and Year One, then there's Watchmen, Love and Rockets, Akira, lots of 80's love in there. MS: From the poor cat in issue six, to the hilarious future herpes covered Mr and Mrs. Arguello and there herpes covered kids in issue 16 you've tackled the book's darkly comedic moments in a variety of ways. As an illustrator what's your approach to drawing comedy? WC: It depends on the joke, but I find I like to keep the same shot throughout, show most of the figure, have it read like a comic strip. When we see that I think we're reminded of comic strips so we know we're seeing something with a punchline. 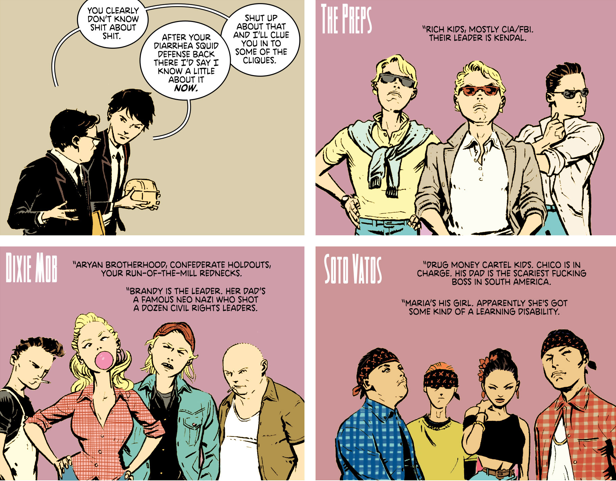 MS: One of the amazing things when I read Deadly Class are the diverse approaches in style. How you illustrate varies between what's going on in Marcus's head - with his memories, what's going on with Marcus's acid and/or mushroom-induced state and what's going on in reality. How would you describe these different aesthetic approaches? WC: I've always had a problem sticking with one style throughout my career. In the past few years as I've become old and decrepit and my brain's beginning to atrophy I find I'm settling down a little bit more into one style, but I still like to play around, try and stretch myself, so when there's flashbacks or things like that, I take that as an opportunity to use a different approach. MS: What aspects of Deadly Class do you enjoy drawing most? WC: I loved drawing the acid trip issues because you could really go crazy and not be constricted by reality. I love drawing the quite dramatic moments, but then I also love chase scenes obviously, I love the extremes I guess. MS: Your Black Hand comics occupy some fun genre's like pulp and horror. Is there any genre you haven't tackled yet that you'd like to? WC: Yeah I have an idea for something I'd like to write and draw after Deadly Class that would be sort of a Fantasy, Conan type of thing. I think that'd be a lot of fun. MS: Your first three Black Hand web comics were published awhile ago in a collected hardcover from Image comics. With Long Way Home and Martian Lust currently available on your site, is a second collected hardcover in the works? 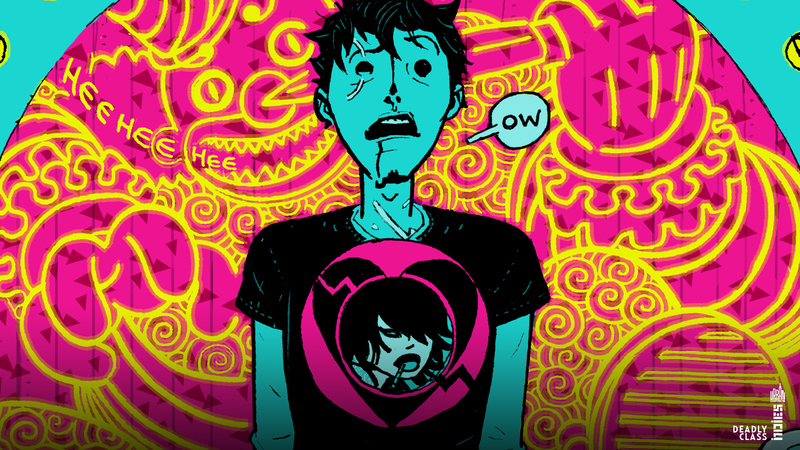 WC: Yeah I'd really like to do a second volume, but it'll take a while, I do them as these short stories come to me, and I have to draw them in-between issues of Deadly Class so it takes a while, but yes, one day there'll be a volume two. I think. MS: Do you have any other creator owned projects planned out for the future? WC: I don't want to jinx it but saying to much, but yeah, right now I'm writing a supernatural story for an artist to draw, if that works out and I can get the right artist that'll be out in 2016-17. And, like I said, I'm thinking about doing a fantasy story after Deadly Class wraps up (so not for another two or three years). MS: Our there any writers out there currently that you'd like to collaborate with? WC: Aside from doing my own stuff I'd love to find something to do with Rick again in the future, hmm... Jason Aaron, Grant Morrison, Brian K. Vaughan. They all do great work, we'll see. MS: With Deadly Class returning in December is there anything you can tease about the upcoming arc? WC: Yeah well, this is where everything comes to a head. I'm serious, everything really has built-up to this story arc Die For Me (issues #17 to 21 or Volume 4 in collections). Issues 22 and after will be about the fallout from what happened in Die For Me. So you're going to want to keep up to date on this one True Believers! MS: For those who are interested in perusing a career in creator owned and self published comics what advice would you offer? WC: If you want to self-publish, I'd say you should start small and put it online. Try to do your best 10 page comic before taking on your epic 600 page graphic novel y'know? Then you build from there, learn from your mistakes, if you're a writer, find an artist as hungry as you are. Finish what you start and keep producing work. Thanks again to Wes Craig for talking with us here at ComiConverse!